Manufacturer: Ricoh Imaging Company, Ltd.
Get closer to the action and enhance student interaction with the compact RICOH PJ X4240N projection system. Use it to project large screen presentations in high-definition from close distances to maximize impact and classroom space - while minimizing instructor distractions. The short-throw projection system significantly reduces glare and shadows, so instructors can conduct interactive presentations with more clarity and more student participation. 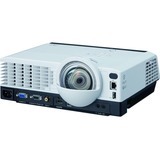 Presenters can take advantage of its exceptional image quality, advanced connectivity, intuitive controls and flexibility. Mount the projector, place it on a table's edge as a standalone system, or add it to your total print and visual communications fleet to reduce costs and improve efficiencies for your institution.